This comfortable chalet is clean, smoke-free, fully furnished and is available in the heart of outdoor living. 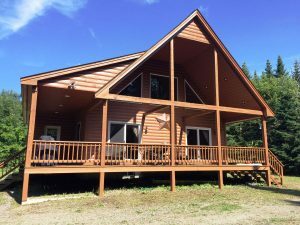 The home is directly located on the ATV Trail & the NH Snowmobile Trail #142 to take advantage of this area's top adventure activities. There are 3 bedrooms as well as a loft for sleeping. It has 2 private bathrooms (one with a whirlpool tub), satellite flat-screen TV, fireplace, free wi-fi, cell phone service and can sleep 8 comfortably. The kitchen is fully equipped with appliances. Pets are allowed for an additional fee of $10 per pet, per night. It is not wheelchair accessible. Outdoors you will find a large wrap-around porch and fire pit area to sit around and relax. Pittsburg is a year-round vacation destination. There are thousands of wooded acres for hiking, hunting, snowshoeing and cross country/downhill skiing. With an abundance of lakes and ponds in Pittsburg, fishing, boating, kayaking/canoeing and swimming are also enjoyed by our visitors.